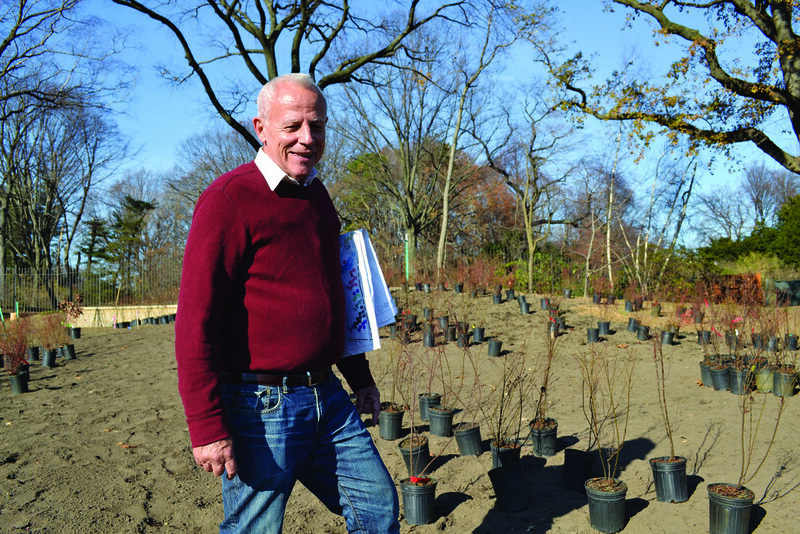 The celebrated landscape architect Darrel Morrison is best known for designing wide-open prairie-inspired gardens like his landscapes at Storm King Art Center and the Native Plant Garden at the University of Wisconsin Arboretum. But the New York City resident's most recent project is much more urban and closer to home: BBG's Native Flora Garden expansion, which opens later this month. On an earlier visit to the Garden, he took a break from planting pitch pines to talk about ecological art, the beauty of native plants, and why he’s glad that his work will never be done. BBG: Have you always used native species in your work? At some point I realized there’s got to be more than this. I saw the light when I read American Plants for American Gardens, by Edith Roberts and Elsa Rehmann. They convinced me of the importance of looking at native plants as parts of communities. It’s such an eminently reasonable way of looking at landscape. Working with the plants that were here before we were is a way to create a real sense of place. Did that inspire you more than the idea of educating people about native plants? Many people will have you thinking that those are two different things, but I believe that people will first be attracted by what’s pretty—the attention grabbers like mountain laurel or lupine. Then once they’re drawn in, they start to notice patterns and differences. I see it when I’m teaching field courses with students. First they’ll notice the colorful flowers, then the surrounding grasses and ferns, then the greater environment and the complex ecology of the place. I love to get people “hooked” in this way. So, is designing a native plant garden a lot like restoring a natural area? It’s more like a capsulization. You can’t re-create nature in a space this small, but you can get the essence. So what we want is to provide a small sample of a pine barrens for people who have never been to one. To most visitors, it will look a lot like the plant groups here occurred naturally, but actually a lot of design was involved in the way the plants are placed. Would you say that you compose the landscape in the same way a painter composes a painting? Well, there is an art to it. Not only do you want to hew to the ecological integrity, you also want to create a space that is experientially rich; it should look beautiful, and there should also be sounds and smells. There should be other forms of life too— birds, butterflies, and other pollinators. Do you consider a garden a work of art? Yes, but unlike most artists, we garden designers have the luxury of working with the fourth dimension—time. So what we’re creating here will always be a work in progress. We set it in motion and let it take off, and people will see a different garden each time they come. Visit in the late spring and you’ll see a blanket of small, colorful flowers in bloom, but come again in October and you’ll see a different place, with tall grasses waving like ocean waves. And then the following year, there will be more differences still. It will never be “done,” and that’s one of the most exciting things about working with plants. That’s exactly how it should be. A pleasurable surprise to find this article. It’s good to see Darrel Morrison again after too many years and especially good to see him continuing his great work in the use of native plant materials. He’s been an inspirational professor and kind mentor to so many, especially me, and of course a long-time proponent of native plants and plant communities. I have a question about a plant in your garden. The New York Times article captioned the photograph “Honeybells.” Could you please tell me the correct botanical name, I’d love to find one! Darrel Morrison at BBG. Photo by Elizabeth Peters.